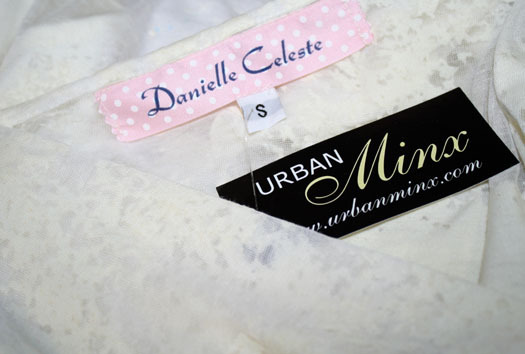 the lovely danielle of danielle celeste sent me one of her beautiful, handmade originals...this asymmetrical burnout cardigan. the lighting in my photos doesn't do it justice, but it's a beautiful ivory color, and the lightweight material makes it a versatile piece for this warm-weathered state. i look forward to working it into my current wardrobe. by the way, this is the package that took over one month to get here. 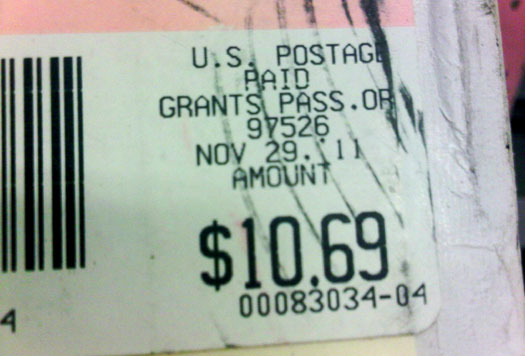 i included a picture of the postage date for proof. have faith in the postal system, my friends. so blogger finally added a "reply" button to our comments. it's nice to have the option to respond to your comments directly. but, i'm curious...do you re-visit posts to read replies? do you subscribe to comments? or do you prefer a response via email or on your blog? carrot cake...mini-he chose this because of the "white stuff". the boy loves his frosting. find these and more favorites at currently obsessed. Oh my goodness. Is it really handmade? It's gorgeous. What a beautiful cardigan! And I loved the pearls and the shoes! 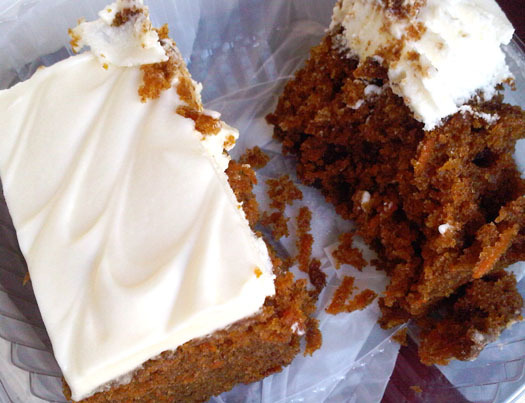 And the carrot cake with the frosting, yummy! I did re-visit blogs in the past to see if they replied to my comments, but I don't anymore. It takes a lot of time. But it's nice to see that the bloggers respond to their readers' comments. On my blog, as you may have noticed, I've put a reply plug-in which sends an email to the commenter, every time someone replies on their comment. I hope it's not annoying...I like it, and I haven't had any complaints. As for the new blogger reply, I saw it too on some bloggers over this past week, but I must say that since they put it, I'm having some trouble commenting on some blogs. I press the publish button again and again and sometimes it isn't even being published. It's so frustrating. I don't know why this is is happening. i agree! I've had a hard time commenting on a few blogs that require a verification code. i've had trouble commenting, too....it just freezes when i try to comment. i guess the timing makes sense as this was when blogger implemented the reply button?? Absolutely gorgeous! I love that you paired it with those tights and those amazing shoes. They are my favorites! Becca your tights are amazing!!! I love them! Extremely flattering for those lovely legs! The sweater is lovely...slow postal service and all! Worth waiting for. I do occasionally go back to look at replies, but not all the time. I love that your cardi is longer than your dress- its like a jacket look but less warm/ indoor appropriate! Great stockings too! omg omg the nine west shoessss!!! I literally went back and forth debating to buy these. I they look so good on you!! and that cardi is perfect for hawaii! Pretty! Very delicate...that last shot shows off the hemline beautifully! Hope you had a fabulous New Year's babe! I started to have comments sent to my email so I could reply that way (although the commenter has to have an email address "attached" to their profile for it to work) but it does get overwhelming sometimes. If I've asked a question then I will check back to see if it has been answered or the next time I visit that blog I will look to see if my previous comments have been replied to. I don't think many people check to see if they get replies though especially when most comments on nail blogs, like mine, just express a positive reaction to a manicure or polish. i prefer a comment on my blog cause it's difficult to backtrack. i love the tights and that cardigan is definitely worth the wait. That cardigan is absolutely amazing on you. How clever and kind of Danielle. I love this look. It reminds me of an edgier Audrey Hepburn. I never revisit blogs to look at replies. If anything, sending an email is the best bet. It's a great cardigan! LOVE the uneven hem! Digging the tights and the shoes too!! Re: I guess I'm kind of slow but I just realized that anyone can reply to someone else. In that case, I think the reply button is going to be a great community creator. THAT cardigan is beautiful. I love it especially with the dress and the gorgeous tights! I am so glad that blogger has the reply button. now I don't have to hunt an email addy down to reply to questions! Girl, great minds think alike! I actually wore my cardigan this way too with very similar accessories. You look amazing and that cardigan is FABULOUS!!! This is definitely one of my favorite outfits dear! You look absolutely stunning! You make pearl look sooo cool. 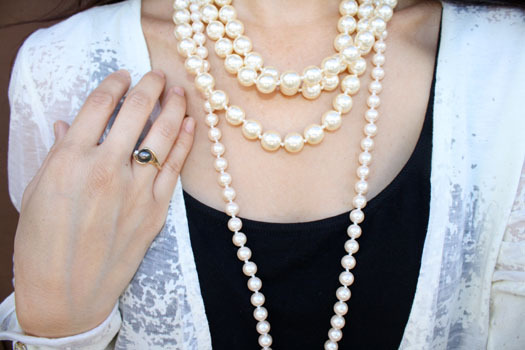 I am normally not a pearl girl but when I see your outfits I love them. This sweater is one of the loveliest I've seen! I don't normally go back to check for responses on comments, really. Sometimes, it's all I can do to find time to check a post the first time, so unless I've asked a specific question that I think will be answered in a return comment, I don't check to see if anyone responded. links a la [oomph.] 04. Cafe Well. an [oomph.] discovery. sponsor love . the shop of worldly delights. experimenting with extremes. animal prints 02.
don't hate me because i'm...intellectual.